Easy Felt Crafts - Christmas Stockings & Ornaments! See our newest selection of Easy Felt Craft Kits for making your own felt Christmas Stockings & Ornaments. These easy felt kits from Dimensions have everything you need to get started crafting! Holidays and crafting just seem to go together. Now is the perfect time to get started creating your handmade felt Christmas stockings & ornaments, before the busy holiday season begins. You'll find them in the Christmas Craft Kits section of the store. 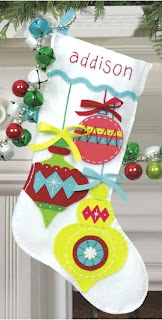 The Bright Ornaments Felt Christmas Stocking Kit includes die-cut felt, cotton thread, needle, and easy instructions. The felt pieces are pre-cut into shapes, so no cutting is required! They're also pre-punched with small holes for easy hand stitching and embroidery. Step-by-step instructions make it easy for beginners to create one of these colorful felt Christmas stockings for a loved one. They're also a quick & easy felt project for experienced crafters looking for a convenient kit with everything you need to get started. The Bright Ornaments design has retro modern appeal, with three bright bows accenting three classic ornaments. The finished size is approx. 19 inches long. The Catching Snowflakes Felt Christmas Stocking Kit die-cut felt, pre-sorted cotton thread, needle, and easy step-by-step instructions. If you're new to working with felt, the Dimensions felt Christmas kits are an ideal option for you. Projects use easy hand sewing construction and simple applique embroidery techniques. Stockings are a fun felt craft project for teaching older children and teens basic hand sewing skills while they're creating a lasting holiday keepsake. 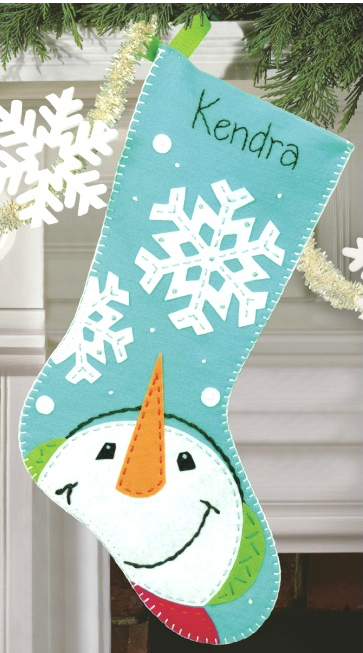 Catching Snowflakes is a cheerful stocking design of a happy snowman looking up at falling snowflakes. The finished size is approx. 19 inches long. The Holiday Trio Felt Christmas Ornaments Kit includes pre-cut felt pieces with holes for stitching, cotton thread, cording, stuffing, needle, and easy instructions. Kit makes three felt ornaments, perfect for trimming the tree or decorating holiday gift packages. 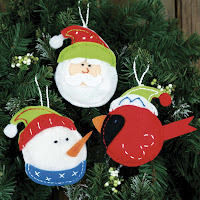 Felt Christmas ornaments are a fun holiday craft project for the family to work on together. Create some holiday crafting memories! Visit the Christmas Craft Kits section for details on these kits and to see our complete selection of felt Christmas kits, including felt stocking kits, ornament kits, tree skirt kits, and more! Weekend Kits offers a unique selection of Creative Art & Craft Kits for the whole family! Craft kits for beginners and all skill levels. Stop by today and be ready to start crafting for the holidays on your next Weekend at Home. Jungle Themed Stamped Cross Stitch Kits for Baby! You won't want to miss our newest selection of Stamped Cross Stitch Kits for Baby from Dimensions – a charming baby quilt kit and coordinating baby bibs kit. Kits include all the materials you need to create a wonderful quilted blanket or pair of bibs for baby. You'll find them in the Stamped Cross Stitch Kits section! 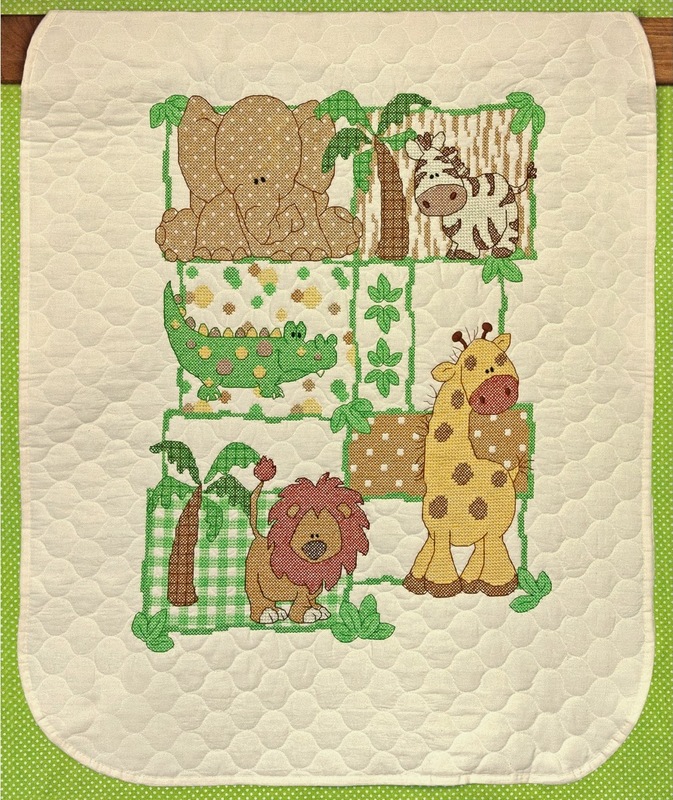 The Kimba stamped baby quilt design features a collection of jungle animals, including an elephant, zebra, alligator, lion, and giraffe. Kit includes a pre-finished quilted muslin baby blanket (cotton/poly), presorted cotton embroidery thread, needle and instructions. The cross stitch design is preprinted on the quilt in wash-away ink. Soft shades of green, brown, and yellow look great against the muslin fabric. The Kimba embroidered baby quilt would be the perfect addition to any baby's nursery! You'll need an embroidery hoop and pair of scissors to complete your stamped cross stitch projects. Using an embroidery hoop will help you maintain even & consistent stitches across the fabric. The Kimba stamped baby bibs feature the zebra and the lion. Kit includes two pre-finished quilted muslin baby bibs (cotton/poly), presorted cotton embroidery thread, needle and instructions. The cross stitch designs are preprinted on the bibs in wash-away ink. 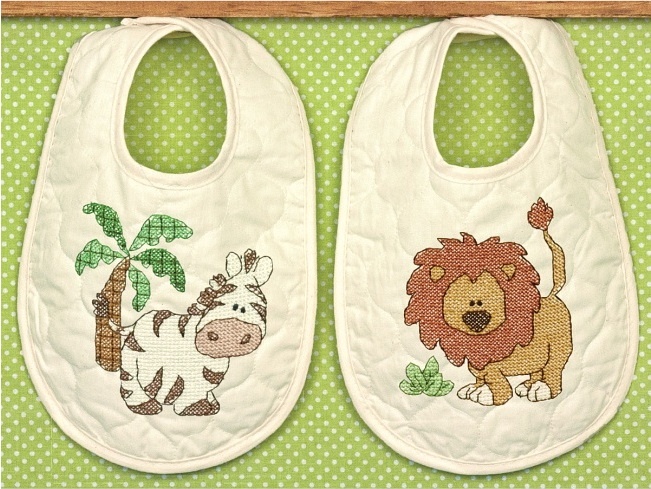 Stamped baby bibs are a great beginner embroidery project. The smaller size makes them easy to handle and quick to stitch! In stamped cross stitch embroidery, the X's are preprinted on the fabric, so no counting is required. You follow a design chart to known where to place the thread colors as you stitch. Visit the Embroidery Kits section for details on these kits and to see our complete selection of hand embroidery kits, including stamped cross stitch kits, counted cross stitch kits, crewel kits, and more! Weekend Kits offers a unique collection of Creative Art & Craft Kits for adults, teens, and kids. We believe learning a new craft should be easy, affordable & fun! Stop by today and be ready to start cross stitching on your next Weekend at Home.